First cook the rice. This usually takes 40-50 minutes. Meanwhile, cook the bacon in 1 Tbsp. of olive oil in a large skillet until almost done. The skillet should be large enough to hold all the ingredients. If you do not have a large skillet, you can transfer bacon to large pot. Add onions and garlic. Cook until bacon is done and onions and garlic are translucent. 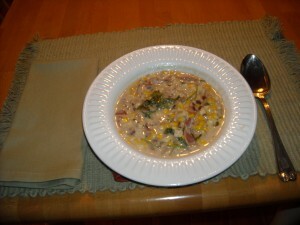 Add ginger and cooked corn. Saute a few minutes. Add chicken broth, coconut milk, salt and pepper, arugula or spinach and cooked rice. Heat through for about 10 minutes. Spinach or Arugula should be cooked and wilted. Serve hot with a crusty bread. That soup looks delicious! I think I will try adding some white beans to it and corn. I just printed this recipe, can’t wait to try it! Thanks for the comment and let me know what you think when you make the soup. Thanks for that info, useful stuff. I get bored of plain rice but I’m not exactly very skilled in the kitchen. There’s loads of unique ideas at this rice recipes website I found that your readers might like too. Thank you for your comment on our blog. We will keep posting if you will keep reading!